I’m always interested in saving money, reusing ‘trash,’ and leaning how to make useful items for everyday and survival situations. Reading through Suvival Hacks by Creek Stewart, I found exactly this type of information. Mr Stewart shares a lot of super easy projects that you can create from found objects, plus some inventive uses for materials you may have laying around your house. Creek Stewart is the owner and founder of Willow Haven Outdoor survival training school in Intdiana, named one of the Top 10 Survival Schools by MSN Travel. He also hosted two seasons of Fat Guys in the Woods on the Weather Channel, and is the author of the best selling Build the Perfect Bug Out series of books. Survival Hacks: Over 200 Ways To Use Everyday Items For Wilderness Survival is filled with great suggestions for materials to pack with your gear for camping trips. There are plenty of simple projects, to more in depth survival hacks shared on the pages of this easy to pack book. You’ll find information for shelter, water, fire, food, staying healthy, gear, and forward movement, plus a chapter devoted to survival kits. These ideas are best practiced in your backyard before you head out in the wilderness. 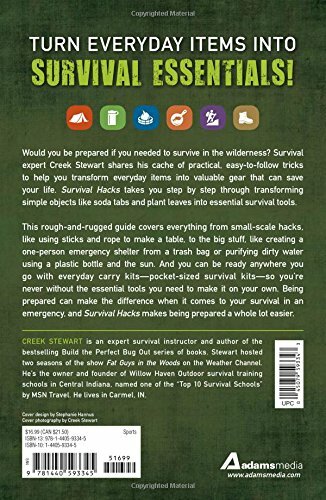 Some of my favorite survival hacks from this book include: Use Ice to Make Your Shoes More Comfortable; Pop Tab Tensioner; A Simple Blackout Air Conditioner (see the video on his website); Moose Poop Could Save Your Life; Pop Can Alcohol Stove; Spider Web Net; and Bottle Cap Scaler. A lot of these survival hacks aren’t just great ideas for taking on your camping trips, but can be used to replace tools and techniques around the home too. I want to try out the Modified Swedish Torch for cooking in our backyard this summer. The Viking Clamps look like a great way to secure a small project on your workbench if you don’t have a C clamp on hand. For those who would like to reduce, reuse, and recycle old stuff, this book will be a treasure trove of great ideas! In addition to a book full of survival hacks that may also come in handy for everyday life, Creek Stewart includes a section at the end of the book on EDC (everyday carry) On A Budget Kits, including the Mentos Container Pocket Kit and several others. For folks who want to put together small survival kits without blowing the budget, these mini-kit lists are an excellent resource. 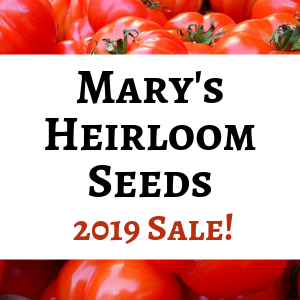 As my husband and I work to reduce our expenses and move to a more remote location after retirement, this book gives me hope that we will be able to make do with fewer specialized tools and equipment. It also reminds me of our friend Mark, who has always lived his life making do with whatever he had on hand to accomplish tasks around his cabin. From his homemade hot tub to the interesting array of seating around his campfire, everything was made from found objects or repurposed items. The older I get, the less I care about how things look, as long as they function and are useful. So having a neat book on hand, like Survival Hacks, is a great way to get started on a new adventure, or to make your current adventure a little bit more comfortable. Check out the Willow Haven Outdoor website! You can also take a look inside Survival Hacks on Amazon. 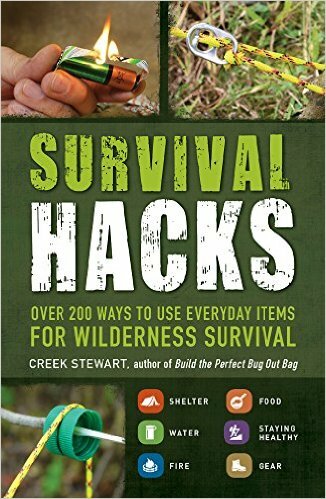 Disclaimer: I received a free copy of Survival Hacks by Creek Stewart to review. All opinions are my own and are not influenced by receiving the book for free.